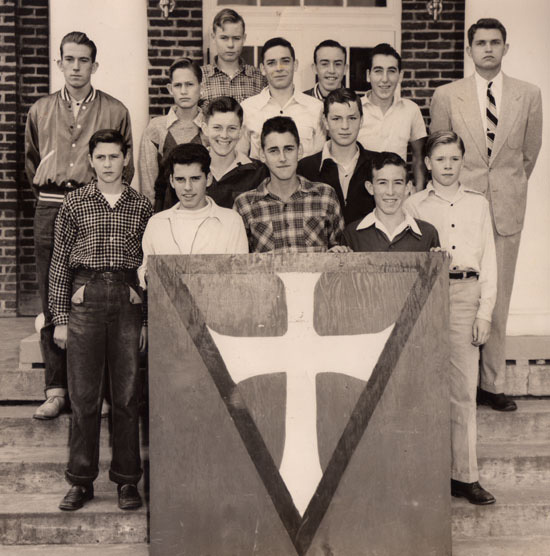 Comments: The Hi-Y was a national movement in U.S. schools in the 1950's, and boys all over the U.S. strived to accomplish the club's goals, "Clean Speech, Clean Sportsmanship, Clean Scholarship, and Clean Living." The main objective of the Scottsville High School's Hi-Y club was service. One of the ways by which club members achieved this objective was by distributing baskets at Thanksgiving to needy people in the Scottsville community. First Row (L to R): (1) John Clements; (2) Eugene Carden, Vice President; (3) David Catlett, President; (4) Jimmy Rae Haga, Secretary and Reporter; (5) Lou Joe Eyre. 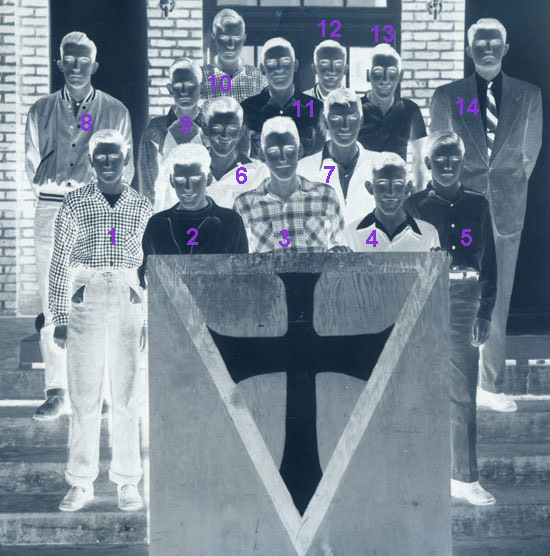 Third Row (L to R): (8) John Bohick; (9) Edward Bailey; (10) Garnet Mayfield; (11) Paul Jones; (12) Henry Haga; (13) Frank Harris; (14) Mr. Robert Maidment, Faculty Sponsor. Treasurer Durwood Ballowe is not shown in this photo.